I am very excited to announce a giveaway on my blog! A little time ago an online fashion store SammyDress contacted me and asked if I would like to partner up with them & host a really cool giveaway for my lovely readers! I couldn’t say no, because I like the thought that 2 my lovely blog readers (yes, you heard right! There will be 2 winners!!) 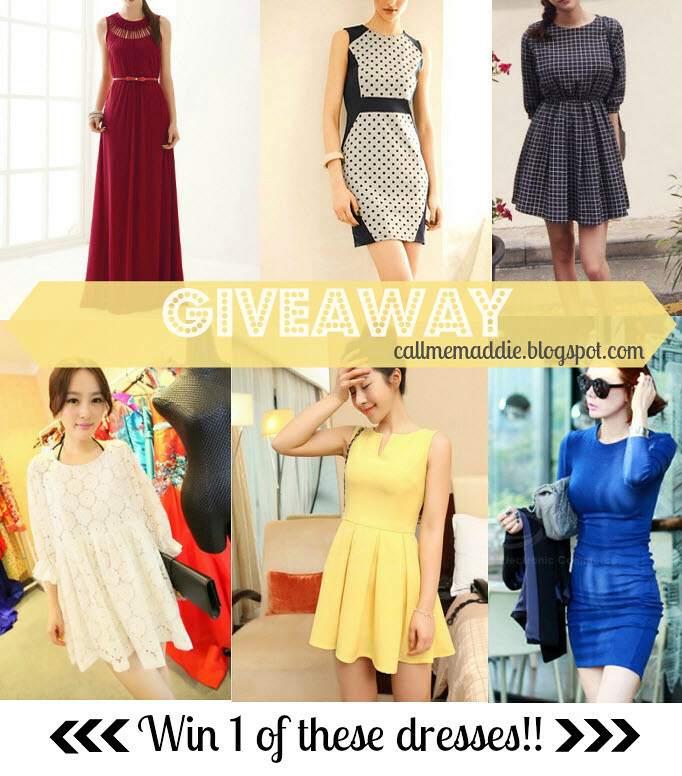 have the chance to win a dress from their own choice! And that is it! This giveaway runs till Tuesday, October 22nd (12:00pm). The 2 winners will be selected randomly and contacted by their given email addresses! P.S. SammyDress is also holding a giveaway on their blog, you can win a $30 giftcard to spend in their shop (which is actually a lot, since the clothes are really cheap & you can get, for example a pair of shoes under $15!) For more information look on Sammydress’s blog! Such a great giveaway! I'll have to check out their site! I´m absolutely in love with this dress: http://www.sammydress.com/product458637.html!! ♥ ♥ But I love lot of items from their store, there are perfect dresses, but also bag and shoes, really large selection of products! And simple summary design, summydress is perfect way how to buy lot of clothes for a low price! elijo el vestido nº 3, es ideal para esta epoca del año. I really like dress #5, and my quick review of Sammydress is that they have really cute, affordable clothing. I love that they support fashion bloggers too! Hello, I follow your blog please follow back and the dresses are lovely especially #1, #2 and #5. Number three is really nice! This is a pretty amazing giveaway! All the dresses are gorgeous. Dress number 5 is totally my favorite! I love the store and how colorful it is! My choice is number 6. And I love how affordable is everything in the store and they ship internationally. 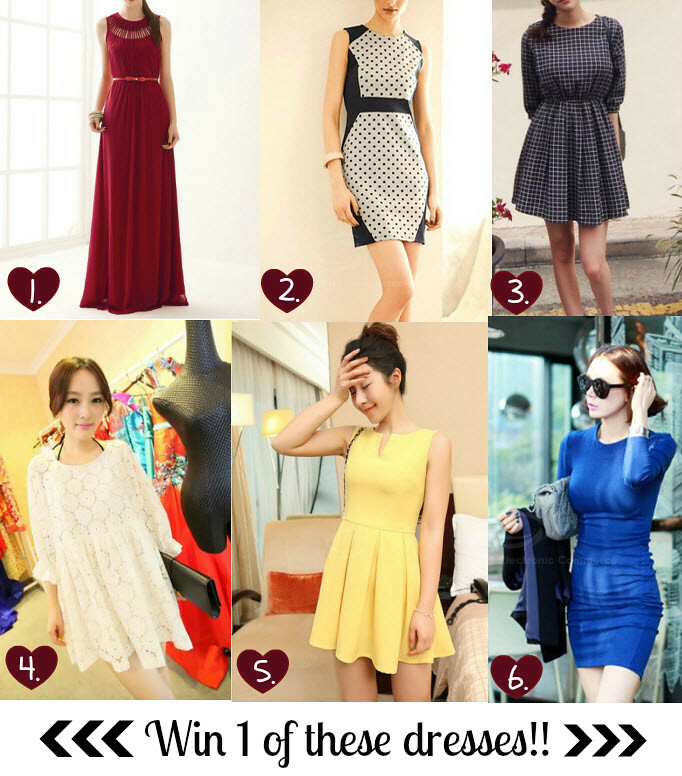 Love number 5, I've been looking for a yellow dress! I love the fact that they ship over the world! Number 1 please, its so gorgeous and elegant! Great giveaway, I am not a member of Facebook so not sure if I can enter. Many Thanks from Ray & I for your kind comments on my last post. I think the store is great and the prices are super low! The only thing is that shipping is not included, but a friend bougth from there and it was pretty fast. So it's great! Great dresses for low prices! My fav is dress #1. I haven't ever bought anything from SammyDress, but I really am tempted to! I love dress #6 Cobalt is so on trend right now too! I found their site very easy to navigate with nice photos, their prices are great, and their selection and styles are amazing!!! Thanks so much for letting us know about Sammydress! I love dress #1, it's a great option for a wedding party. The store has many options at amazing prices. The website is just wonfderful, so many choices and beautiful outfits, just what a woman like to wear! I think it 's a nice store with many beautiful items. I like Sammydress, the clothes are really cute. sammydress is an amazing online store, I think they have really low prices and good quality. and they have always competitions, what I really like. my favorites are:1 and 5. My favourite is Item #1. Sammydress has got a wonderful collection of outfits ranging from feminine dresses to flirty skirts to chic apparel! And it's priced very affordably which is perfect for us youngsters! My first impression of the site is that they have it organized well and that it seems like a really good deal for the prices. (Though I do not know the quality). Cute giveaway! Love #5 and they have a fabulous store!! Ahh, it ends on my birthday! Sammydress may seem untrustworthy with all the bad media going around about Asian wholesale stores, but it's much different to the rest, in my opinion. I like that there's range, as well as quality. The prices are a plus, too so that anyone can dress just like the models do. I didn't know the store, but I was very pleased with what I saw. Beautiful pieces and prices very satisfactory. Loved it! I would love win the the 5th dress! The Sammydress.com have things and clothes what i don't found in my country and the price is accessible, I love this store! I would love to win the 3rd dress! The Sammydress.com provides wide arrays of clothing, from dresses to shoes. I love their dresses because it can be worn on a regular day or elegant parties. i want dress #1 and dress #4, please. mo11yb1ue@yahoo.com. Thank you! i actually know of sammy dress from before, and they have a great selection of styles for awesome prices. thanks so much for the giveaway! Entered the give away…liked both the pages…Loved the first dress..though I would love it in apricot! It seems to be a really nice store. Its a living proof of the fact that one does not need to burn a hole in her pocket to look good. Really cool and trendy collection. Thumbs up! I couldn't decide so I picked 2 dresses as my favorite! :) Lovely giveaway. I love the dress #1 Sammydress offers wide range of fashion items 🙂 great products at affordable price. they also offers free samples to bloggers and pin to own items 🙂 highly recommended web page for fashion seekers. The Scoop Neck Color Block Polka Dots Sleeveless dress I have it already and is gorgeous, lovely and soft material. Sammydress has many wonderful dresses like this one, I could spend an entire day. Yeah I love dresses. I saw small prices that's important for me too. Thank you for inviting me, doll. I like dress number 1, it's so gorgeous! All items in store are affordable, great looking and many are on my wishlist! I like Sammydress because they have cute and girly clothes at amazing prices! I could spend an entire day on Sammydress because they have great products at affordable price.Other thing that i like is that they also offers free samples to bloggers and pin to own items . First dress is amazing, and there is a lot more great items you can find on Sammydress. I have heard about rampant online stores where you can just check on the net, click your order, pay it online and kaboom your selected item will be shipped in no time. Yes i have been joining giveaways to and fro and have bumped into several online stores but this is what I was amazed of upon checking the website, to qoute: "Cheap is what we charge, choice is what we offer, value is what you get". It just clearly gives us (buyers) the impression that you just did not put up the store just to profit by people buying in it and thats just it. In sammydress.com, you show buyers that they are not 'just' a buyer but is also a valued one. I love that show. Amazing prices and amazing garments. Wow, Lucky one whoever wins!! Lovely dresses! I've done some shopping in it, I fell in love. I'm from Brazil. The delivery was very fast. The products are of excellent quality. sammydress is a cool online store. fashion on a budget! nice! This is such an awesome giveaway! I didn't know the website and just spent so much time browsing through it. The prices are really unbeatable! I love that blue dress and the price is incredible, but the small size is sold out. There are so many beautiful things on the site. I love SammyDress! They have beautiful clothes with great prices! thank you for your giveaway my favorite dress is number 2 very elegant…my email is smpyrrr@yahoo.gr the prices is so much lower than in my country,many greetings from distant Greece…..kisses and thanks again…..Sammydress is a very interesting shop line store, with plenty of wonderfull dresses! I love them all but the first one is my fav!!! The dresses are all gorgeous…and thanks for the email about this! I love your blog (and honestly, it's always great to find out about another beautiful fashion blog). (: The 1st and 5th dresses are my favorites. What about you? I am so happy to find this site. I am looking for a dress for a vow renewal I have coming up. I cannot wait to explore the dresses, but their shoe selection is so delightful I don't know that I can tear myself away from the shoes! I love that people with limited budgets can get a hold of trendy pieces without breaking the bank! 2 and 5 are my favorites. I love the Sammydress store because all of the clothes and accessories are very cute and inexpensive! I am impressed with this compnay, but alas, I will not enter because if I own one more dress my closet with explode. My fav is dress # 2, BTW. Great Giveaway! and free shipping internationally . SammyDress is one of the best online stores, the prices are really great, we have plenty of choice: we can buy casual clothing and even clothes for parties and cocktails, even weddings! The best point is that we see how the clothes fit because there are pictures of the models wearing them, and that is amazing because not many stores have that! I literally just ordered from Sammydress for the second time today, and I was planning to buy dress #1!! I love that dress! Review: The prices on Sammydress is amazing for decent quality clothing, so I love it! There are soooo many choices too, and the items are so unique! Thanks so much for hosting this giveaway, and good luck to everyone! I love the this store because the price is sooooo good! Love this store for wonderful collection of dresses! I love dress 1, the shop online has amazing clothes! Love your blog. Love finding other fellow fashion bloggers who share the same passion for fashion as I do! :) I love number 6! I am a size medium! I absolutely love their piecs! And for those awesome prices!? Can't get any better! Would love to feature them on my fashion blog! The dress no. 3 is my favorite! Love their site, they have trendy and really affordable clothes! Sammydress online store is a paradise for women! For the variety of clothes, accessories, handbags, and for good prices! I love the 5 dress!! Website has great selections, clean layout. great and very cheep store with beautiful clothes! So many cute dresses! I think I'd choose dress #1! And the prices are crazy good! dress #1! this maxi dress would be perfect for my harp performances! -affordable dresses in new styles! love the variation in length, color, and designs! Eu amei o 5,lindo demaisssss!!!! Adorei a loja,tem uns modelos mais lindos que o outro,dá vontade de comprar a loja toda! I'm in love with this dress: http://www.sammydress.com/product838514.html?siteID=TnL5HPStwNw-AnJtuMf9GXnIkQZI6TRSSw It's simply a fantastic color! Review: This store is fantastic cause there is such variety and the prices are low so that everyone can feel that they've purchased a great deal! Sammydress is the best online shopping store I have ever come across. It has an awesome collection of dresses and accessories that suit all occasions and festivals. It has also an exquisite collection of home decor items and gift ideas that anyone would like to shop from. Their products are fashionable, trendy, gorgeous and yet available at affordable prices. Their site is easy to navigate and they have an excellent customer service. It is really a treat and a life-long experience to shop at Sammydress store. lovely dresses & affordable too! Sammydress.com is a great online shop. You can find cheap produts and high quality items. I have ordered jewlery, clothes and shoes and they were all nice. Sammydress is a fashion store, which we can buy cheap and hawsome clothes. I've already bought jewlery from there and everything was great! If I get the chance to select one from the store I really really love the http://www.sammydress.com/product584440.html dress. If I am to choose one among the above dresses it will definitely be the 5th yellow dress as it looks elegant with a bit of a girly touch, which is just my style. I like dress #5 and #6. Sammydress is an organized online store, no bugs and very easy to search for what a customer is looking for. I found they're store as an online mall. And of course, having free shipping is really good. Sammydress has wonderful clothing and amazing prices. Sammydress had stunning items with great prices:). I love Sammydress, Lovely clothes with great prices! I often buy from this seller: Sammydress has many items at very low prices! Lovely clothes with great prices! Sammydress is a very appealing online store, we can search wonderful outfits and it's very easy to shop. The store sells lot of things I want this cheap price. heya ! i like the first maroon dress too too much . sammy dress store has got the amazing eye catchy dresses n wearing them wud be feeling like a royalness . i love this store like crazy . In my opinion the store is great! The prizes are chip and they have so many dresses for each choice. everybody can enjoy online shopping without worrying too much about budgeting. They also offer wholesale purchase and world wide shipping. The store is so cute! The whole store has a comfortable atmosphere and definitely makes me want to buy some dresses; the dress designs are also so magnificent it was difficult to choose just 1. I like this store, it has amazing prices and trendy clothes! My favorite is dress #1! I love this online shop because they're affordable yet fashionable. great store,lots of awesome dresses!!! Sammydress means a trendy and stylish woman who knows what to wear and has personality! So many different styles and amazing prices! My favorite is the number 1. I like sammydress 'cause there's a lot o variety in styles and the prices are great:! Hi! My favorite is the 1st dress! My favourite is 1st dress! I love #5 dress. The V-Neck pleated sleeveless chiffon dress. I love how this shop captures the essence of sophistication, but is still age appropriate and makes you look younger! I love dress one, it is so elegant. I love their selection and their prices are reasonable. I also love dress no 1, because is so elegant, and as 32 years old "girl" I should have at least one that special dress in my wardrobe. They have so many beautiful dresses, for any occasion you need, and prices are very reasonable. The dress number 3! WOW, WOW, WOW! I've been checking their web site for few hours, it's greeeat!!! Love it!!! I love the 1. Hollow out cotton blend solid color maxi dress! The store is really nice and easy to use. I can found many beautiful dresses, for any occasion and prices are very reasonable!